The Website may be available to you via your mobile Device. Your carrier may prohibit or restrict certain features of the Website from being available on your mobile Device, and some features may be incompatible with your carrier or Device. Kryolan disclaims all liability in connection with your use of the Website via your Device, including your inability to use or access certain features of the Website. The Website contains (i) materials or other items relating to Kryolan and our Products (defined below) and services, including Website layout, information, images, scripts, URLs, sounds, software, and the “look and feel” of the Website, (ii) trademarks, logos, trade names, service marks, and trade identities of Kryolan (including our Products) and other third parties, (iii) Kryolan Products and designs, and (iv) other forms of intellectual property owned by us, our licensors, or our content providers (collectively, “Content”). Unless otherwise specified, the Website and its Content (including past, present, and future versions of the Website and the “look and feel” of the Website) are owned by Kryolan or our licensors or content providers, and are protected by copyright, trademark, or other proprietary rights. You may not copy, republish, upload, post, transmit or distribute any material from this Website for commercial use. Use of the materials for impermissible purposes is a violation of copyright rights and other proprietary rights of Kryolan, our licensors, or our content providers. All rights not expressly granted to you are reserved by us. Any unauthorized use of the Website or its Content for any purpose is not allowed. All trademarks, service marks, and trade names of Kryolan (including the Kryolan name and logo) are trademarks or registered trademarks of Kryolan or its affiliates. You may not use, copy, republish, upload, post, transmit, distribute, or modify Kryolan’s trademarks in any way, without Kryolan’s prior written consent. The use of Kryolan’s trademarks on any other website is not allowed. We grant you a limited, non-exclusive, revocable, non-assignable, personal, and non-transferable license to create hyperlinks to the Website, so long as: (i) the links and the content on your website do not suggest any affiliation with Kryolan or cause any other confusion, and (ii) the links and the content on your website do not portray Kryolan or its Products or services in a false, misleading, derogatory, or otherwise offensive manner, and do not contain content that is inappropriate for children or that is offensive, obscene, lewd, lascivious, filthy, violent, harassing, threatening, abusive, or illegal, that violates any right of any third party, or that is otherwise objectionable to Kryolan. Kryolan reserves the right to suspend or prohibit linking to the Website for any reason, in its sole discretion, without advance notice or any liability of any kind to you or to any third party. This Website may include links to other websites and the plugins from other websites. These links and plugins are provided for your convenience, and they do not signify that we endorse the websites. We have no responsibility for the content of the linked websites. Any activities you engage in involving linked websites are subject to privacy and other policies, terms, and conditions of use, and other rules issued by the operator of the linked websites. Kryolan disclaims all liability in connection with the linked websites. Kryolan may make online ordering services available to users. By submitting a completed order for Kryolan products (the “Products”) you offer to purchase the Products you select and submit to Kryolan through the online order form. Kryolan may accept your order by sending you an electronic order confirmation that your order has been accepted, and Kryolan may reject your order in its sole discretion. The delivery of products is solely limited to the delivery area of New Zealand and in common household quantities. If Kryolan accepts your order, you authorize Kryolan or its vendors or agents to bill your credit card (or other alternative payment method offered by Kryolan and selected by you) the current fees and charges for each Product chosen by you. When you provide bank card information, account numbers or other information necessary to facilitate payment to us or our vendors, you represent to us that the information is accurate, complete, and current, and that you are the authorized user of the bank card that is used to pay for the Products and services. In the event legal action is necessary to collect on balances due, you agree to reimburse Kryolan and its vendors or agents for all expenses incurred to recover sums due, including solicitors fees and other legal expenses (including on appeal). Once an order has been paid for it cannot be cancelled. You must be 18 years old or older in order to place an order on the Website. You may only purchase Products which appear on this Website and are delivered to an address located in New Zealand. You may only purchase Products for personal use by either yourself or your intended recipient of the Products, and not for any commercial purpose or for resale. We may refuse any order that we have reasonable cause to believe is for onward sale other than through distribution channels approved by us. Kryolan will notify you in the event a Product you order is temporarily or permanently unavailable. Details of our Products are available on the Website. Kryolan attempts to describe its Products as accurately as possible. However, Kryolan does not warrant that Product descriptions are accurate, complete, current, or error-free. All features, content, specifications, Products, and prices described on the Website are subject to change at any time without notice. Certain weights, measures and similar descriptions are approximate and provided for convenience purposes only. Packaging may vary from that shown. We make reasonable efforts to accurately display the attributes of our Products, including the applicable colours; however, the actual colour you see will depend on your computer system, and we cannot guarantee that your Device will accurately display such colours. The inclusion of any Products or services on the Website at a particular time does not imply or warrant that these Products or services will be available at any time, and we reserve the right, without prior notice, to limit the order quantity on any Product or service and/or refuse service to any customer. You may not purchase more than five of the same item in any single transaction or series of related transactions. Occasionally, the manufacture or distribution of a certain Product or service may be delayed for a number of reasons. In such event, we will make reasonable efforts to notify you of the delay and keep you informed of the revised delivery schedule. By placing an order, you represent that the Products ordered will be used only in a lawful manner and in accordance with these Terms. When an order is placed, it will be shipped to an address designated by you as long as that shipping address is compliant with the shipping restrictions contained on the Website. A delivery fee may apply to Products delivered to you by Kryolan, and by placing an order you agree to pay such fee. Risk of loss and title for items purchased from the Website pass to you upon delivery of the Products to you. If delivery is available, Kryolan will estimate the time of delivery; however, Kryolan specifically disclaims any liability with regard to late deliveries. 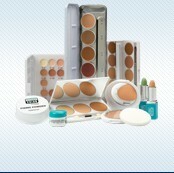 You are responsible for notifying Kryolan within ten days of the estimated delivery date in the case of lost shipments. Please promptly inspect your ordered Product(s) for any damage when your order arrives. If damage occurred to the Product(s) in your shipment, you are responsible for notifying us at webshop-nz@kryolan.com, within three days of receipt of the Product. Please provide your order number and contact information at that time. Please retain the shipping box, packing materials, and damaged items for later inspection. In the case of damaged or defective Product (including delivery of an incorrect Product), you must notify Kryolan of such damage within three days of receipt of the Product. In all other cases, you must promptly notify Kryolan of your desire to return or exchange the Product, but in no event later than 30 days from the date of your order. Provided you notify Kryolan as set forth in these Terms, you may return or exchange a Product purchased from the Website in the event that the Product is defective or for any reason within 30 days of the date of your order. This does not affect your statutory rights. If you plan to return Product, notice must be sent to webshop-nz@kryolan.com, and Kryolan will provide detailed return or exchange instructions at that time. Pack the items carefully to avoid damage in transit; you are solely responsible for any such damage. Address the return package to: 362 Cashel Street, Christchurch 8011. We recommend that you ship the Product via an insured method (i.e. Courierpost). In order to receive a refund or exchange on your returned Product, Product must be in new condition and returned with the original packaging and invoice. Note that only Products purchased on our Website may be returned for refund or exchange via the process set forth above; all Product purchased from a Kryolan location must be returned to the location from which such Product was purchased. You are responsible for the purchase of, and payment of charges for, all Internet access services and telecommunications services needed for use of this Website. All prices are listed in NZ dollars. We cannot confirm the price of any Product until you place your order. All prices include GST. Neither we nor any third parties provide any warranty or guarantee as to the accuracy, timeliness, performance, completeness, or suitability of the Website, the Content, or the Products for any particular purpose. The Website, its Content, and the Products are provided “as is” and your use of the Website, its Content, and the Products is at your own risk. We do not guarantee continuous, uninterrupted or secure access to our Website. You acknowledge that the Website information and materials may contain inaccuracies and errors. THE KRYOLAN WEBSITE, ITS CONTENT, AND THE PRODUCTS ARE PROVIDED ON AN “AS IS” AND “AS AVAILABLE” BASIS AND KRYOLAN DOES NOT PROVIDE ANY ASSURANCES AS TO THE AVAILABILITY OF ANY PRODUCTS OR THE USABILITY BY YOU OF THE WEBSITE OR THE ONLINE ORDERING SERVICES. KRYOLAN DISCLAIMS ALL WARRANTIES AND REPRESENTATIONS AS TO THE ACCURACY OR SUFFICIENCY OF ANY PRODUCT INFORMATION LISTED ON THE WEBSITE. KRYOLAN MAKES NO WARRANTIES, EXPRESS OR IMPLIED, INCLUDING BUT NOT LIMITED TO THE IMPLIED WARRANTY OF MERCHANTABILITY, NON-INFRINGEMENT OF THIRD PARTIES’ RIGHTS AND FITNESS FOR A PARTICULAR PURPOSE, AS TO THE PRODUCTS SOLD, THE ORDERING PROCESS, PRODUCT DELIVERY, OR OTHERWISE. APPLICABLE LAW MAY NOT ALLOW THE EXCLUSION OF IMPLIED WARRANTIES, SO THE ABOVE EXCLUSION OF IMPLIED WARRANTIES MAY NOT APPLY TO YOU. Kryolan will not be liable to you or to any third party for any direct or indirect, consequential, special, or punitive damages or losses you may incur in connection with the Website, your use of or inability to use the Website, its Content, or the Products, regardless of the type of claim or the nature of the cause of action, even if Kryolan has been advised of the possibility of such damage or loss. In the event that the exclusion or limitation of liability for consequential or incidental damages is limited by state or other law, Kryolan’s liability is limited to the fullest extent permitted by law. Kryolan is not liable for any personal injury, including death, caused by your use or misuse of the Website, its Content, or the Products. To the maximum extent permitted by law, you hereby release and forever waive any and all claims you may have against Kryolan from losses or damages you sustain in connection with your use of the Website, its Content, or the Products. Kryolan is liable only to the extent of actual damages incurred to you, but in no event in an amount greater than $100.00. Any claims arising in connection with your use of the Website, its Content, or the Products must be brought within one (1) year of the date of the event giving rise to such action. You agree to defend, indemnify, and hold harmless Kryolan from any claim or demand, including reasonable legal fees (including on appeal), made due to or arising out of your use of the Website or the Products or your violation of the Terms. You also agree to indemnify us for any loss, damages, or costs, including reasonable legal fees (including on appeal), resulting from your use of software robots, spiders, crawlers, or similar data gathering and extraction tools, or any other action you take that imposes an unreasonable burden on our infrastructure. Kryolan will not be responsible for damages, delays, or failures in performance resulting from acts or occurrences beyond its reasonable control, including, without limitation, fire, lighting, explosion, power surge or failure, water, acts of God, war, revolution, civil commotion or acts of civil or military authorities or public enemies; any law, order, regulation, ordinance, or requirement of any government or legal body or any representative of any such government or legal body; or labor unrest, including without limitation, strikes, slowdowns, picketing, or boycotts; or inability to secure raw materials, transportation facilities, or fuel or energy shortages. Kryolan has the right to change or discontinue the Website or any feature of the Website at any time. Thank you for visiting our Website. We hope you enjoy your visit.